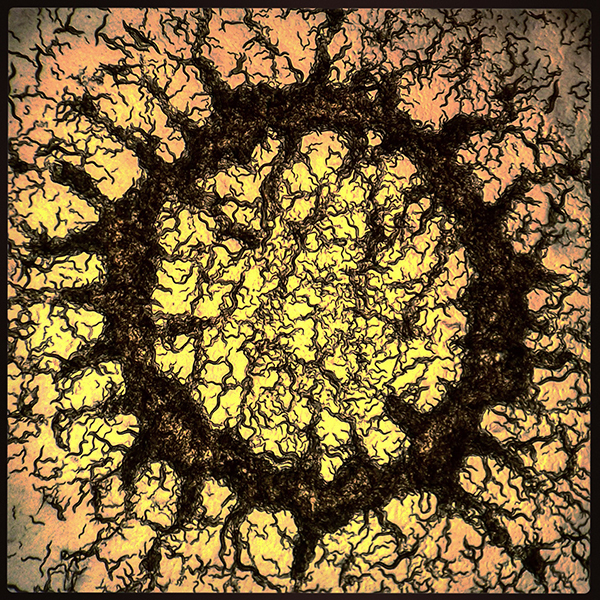 GSA members are well represented among the winners of FASEB’s fourth annual BioArt competition: 4 of the 11 winning images were submitting by our members. The BioArt competition seeks to share the beauty and excitement of biological research with the public by featuring captivating images and illustrations that represent cutting-edge life science research. All winning images and videos are from current or former federally funded investigators and/or members of FASEB societies. Congratulations to the GSA members! This image depicts a colony of Caenorhabditis elegans nematode worms feeding on bacteria. The worms congregate in patches where bacteria growth is the densest, in this case forming a ring. C. elegans are one of the simplest organisms with a nervous system, making them a valuable model in neurobiology. Mr. Brown is studying how serotonin, which is also present in the human brain, affects food-seeking and foraging behaviors and which specific nerve cells are involved. His research is supported by a training grant from the NIH National Institute of Mental Health. 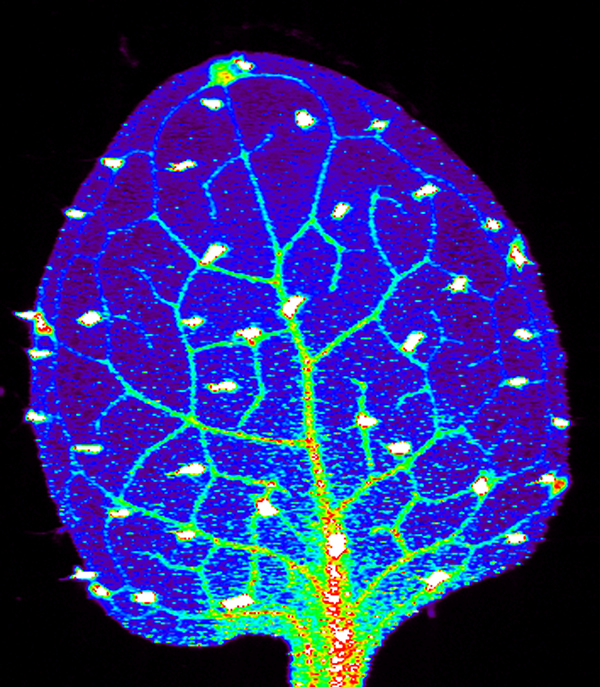 Like most flowering plants, the male organs, or stamens, of Arabidopsis flowers surround a central female organ, or pistil. Precise control of which genes are activated in which cells is essential to the development of these adjacent, yet very distinct, structures. 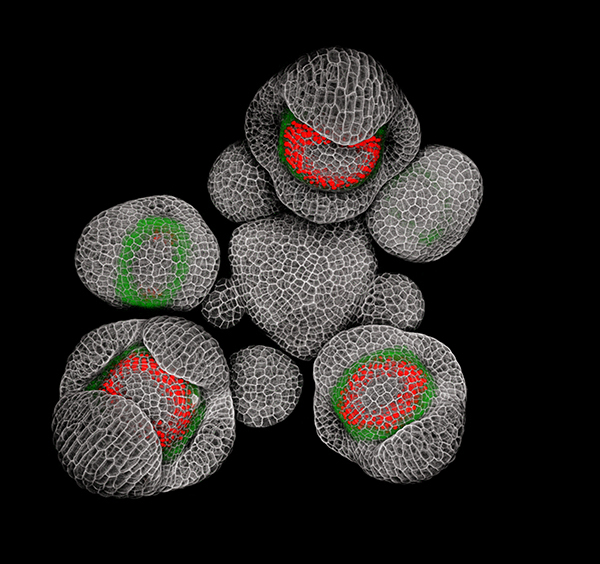 In this image of young Arabidopsis flower buds, the gene SUPERMAN (red) is activated at the boundary between the cells fated to form the male and female parts. SUPERMAN activity prevents the central cells, which will ultimately become the female pistil, from activating the masculinizing gene APETALA3 (green). This research seeks to identify principles of stem cell maintenance and cell specialization, which could inform future studies in agriculture, medicine, and other biological fields. The collaborative team of researchers receives support from the NIH National Institute of General Medical Sciences, the National Science Foundation, and the Department of Energy Office of Science. The essential micronutrient zinc is vital for the function of more than 300 enzymes. Zinc deficiency affects more than two billion people worldwide and can impair the immune system, gastrointestinal function, and brain development. These researchers study how plants acquire, sequester, and distribute zinc with the goal of finding ways to increase the zinc content of crops. Using synchrotron X-ray fluorescence technology, they created this heat map of zinc levels in an Arabidopsis thaliana plant leaf. The National Science Foundation and the NIH National Institute of General Medical Sciences and National Institute of Environmental Health Sciences provide funding for this research program. The Department of Energy Office of Science funds the National Synchrotron Light Source facility, beamline X27A, which was used to create this image. Blood vessels and nerve cells run in parallel through the body and are dependent upon each other for proper function. They also follow similar early developmental paths, as seen in this image of an embryonic mouse torso. Drs. Bhatt and Trainor are studying these parallel pathways, focusing on a molecule implicated in controlling genes during the early development of blood vessels (gray) and nerve cells (red). Detailed knowledge of normal developmental processes forms a critical foundation for research on birth defects and other diseases affecting the development of these organ systems. 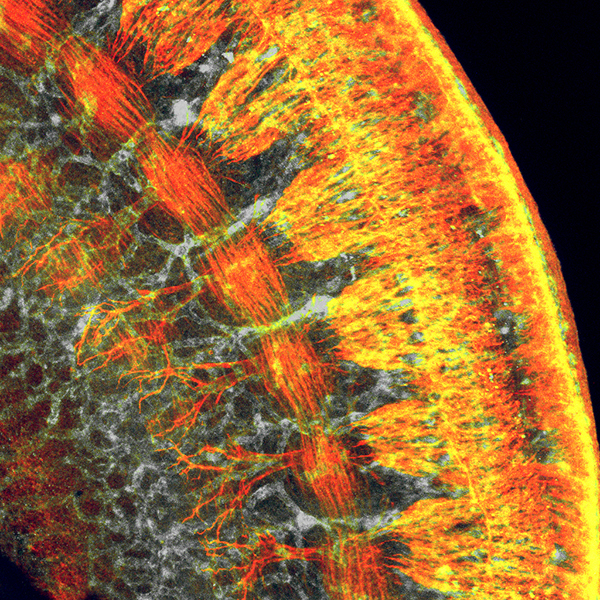 “BioArt Image and Video Competition 2015 Winners Announced,” November 24, 2015.